Google updated the unit conversion OneBox and this time it's interactive. 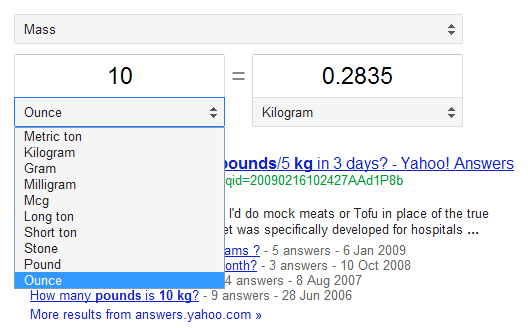 For example, you can search for [10 pounds in kg], get the result and quickly change the number of pounds or kilograms directly from the OneBox. 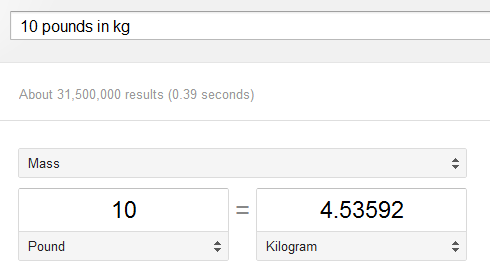 You can also select a different unit of measurement from the list: metric ton, gram, stone, ounce. Google's gadget even lets you change the conversion type and switch to a different category: speed, length, temperature, volume, area, fuel consumption, time or digital storage. The gadget is only displayed for common measurement units, so you'll still see the old interface when you search for [10 pascals to Torr] or [2 radians to degrees]. Now you no longer need iGoogle's metric conversion gadget. Fails to work if you say 6 meters in feet. It still goes to the old way of displaying answers. If you do another conversion first and then say to do 6 meters in feet, it gives you 19.69 but does not give you as 19ft 8inches like the old way does. I have not tested, but I presume this will be the same for pounds in a stone, and ounces and so on since they are cannot be represented in decimals correctly. Will you be adding your currency converter to this? According to that tool, -30 Celcius is BLANK Fahrenheit. Feature copied from Bing search. As usual many will believe that this feature is brought by smart company Google. Only a few know that Google copies small/un popular companies regularly. Cool, I didn't know that. Where can I find the feature in Bing? I wouldn't call this "copied from Bing". Google Calculator has probably been around for longer than Bing has. Clearly, you either don't use the Internet, or you're a Microsoft shill. Google has been converting things since before Bing was an idea. Agreed (with last two commenters). This was not copied from Bing. Google was converting long before Bing existed. Secondly, Bing only converts currency, nothing else. Thirdly, I imagine there were several currency converters online well before Google was doing it, so it definitely wasn't anything innovative when Bing started converting currency. Yes I agree Google Calculator has been there since long. This new version is definitely useful. Ok and when is it coming to a Google near me? This is all because of Google Now... You will see more and more useful interactive items in order to voice / query related searches from phones and other devices to yield useful information. is there a quick way to pull it up other than typing inches feet in search?